Style – T.E.C. 3001 looks unique and different right from the start and never stops. Each stage has its own personal look and feel, using interesting colors and shapes. 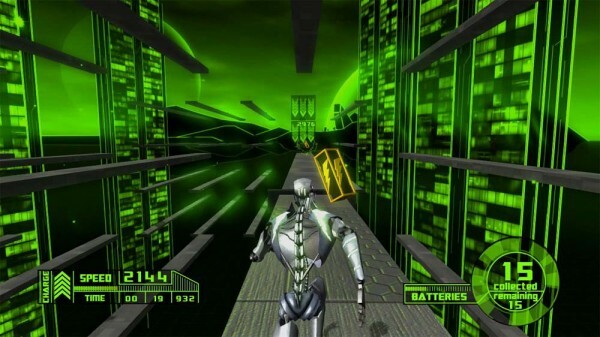 Although all the graphics are a little more then simple and basic, Phoenix Games manages to create a futuristic and cutting edge feel, proving it doesn’t take a the crysis or unreal engine to make a good game. Controls – The controls are very basic and simple either jump, dash or slide as you maneuver through each level trying to avoid any obstacles in your way. These controls are all very spot on, no hesitation or lag in the response from button press to action, this is very important, as anyone who has ever played a platformer can verify. Many platformers have been sprinkled with greatness, but fail miserably due to poor controls. Difficulty – One of the things that was constantly impressive about this game, is that although the difficulty can ramp up to what seems almost impossible, with a little bit of practice a level is always passable. Each stage gives you arrows to pass over to either speed up or slow down allowing you to take the course at pretty much any speed you need in order to pass it. Music – Music is normally so integrated into a game most people seem to over look it, not noticing it until they play a game with a horrible soundtrack. Music helps create a since of feeling, whether it be urgency, fear, joy, or even sadness. Phoenix Games does a great job in using the music to push you and keep your nerves on edge. 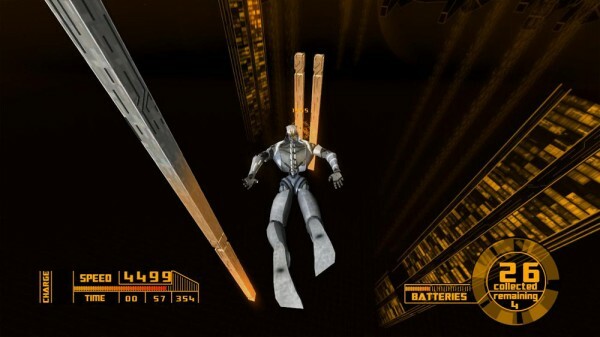 They could have just slapped any techno soundtrack to this and it would have fit, but while you play through you realize the music was hand picked for each level. Another thing they somehow accomplished here is the music never feels old or annoying no matter how many times you have to retry a level. No foresight – Of course in a platformer you don’t want to know what is coming next all the time, but it’s nice to be able to guess what it might be. This becomes an issue from time to time here. Although it seems as if though this should never be a problem as you are constantly moving forward, that still does not stop you from feeling lost. What’s worse is it seems too many times this happens right near the beginning making you jump and dash in every direction looking for somewhere to go. No mutliplayer – Integration may have been a little tricky here, but would have been an awesome addition to the game. Nothing like having someone to challenging you to be the fastest to the end of the map. Take two different T.E.C.’s, put them on the same screen, then watch two friends push/nudge each other as they battle it out for first place. No leaderboards – After each level players are ranked on their performance. With that system it seems as though leaderboards would be a no brainer, yet there are none. You would think that by now any game that tracks how long it takes you to traverse a level would automatically have a global leaderboard system. Platformers are always about one of two things: points or time, and either way should always be comparable to the rest of the globe. Only having a few minor set backs and a lot of things that have been done right this game shines bright in the Indie bin. Add in 20 levels, a heart pounding soundtrack and an almost perfect delivery T.E.C. 3001 creates hours of fun with an unlimited amount of replay value. Whether you have a love for platformers, runners or just games that are a little different this is definitely worth the measly 240 MSP Phoenix Games is asking. T.E.C. 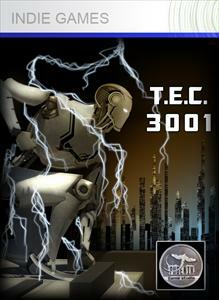 3001 is one of those everyone-should-have-it games. 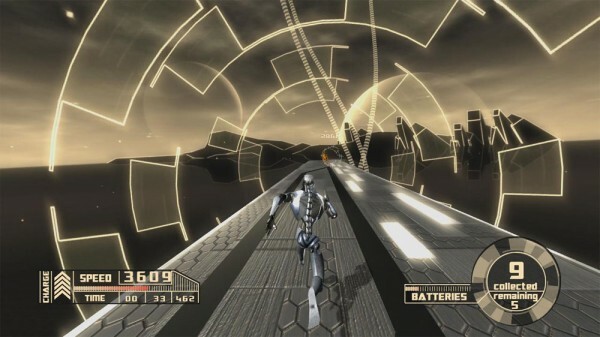 Tron-inspired level design and Trials HD-like challenges are brought together with water tight controls. It’s tough without being frustrating. It’s got silky smooth lines and high replay value for a more than fair 240 MSP. It’s a great little title and it embodies what’s great about Xbox Live Indie Games.